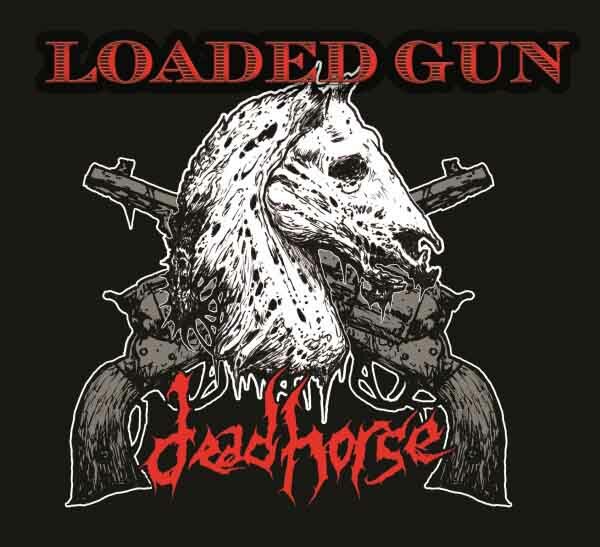 Following a reunion show last year in which most of the original lineup of Dead Horse took to the stage and the success of the Dead Horse/Dirty Rotten Imbeciles side project Pasadena Napalm Division, the Texas thrash band has released its latest work in an EP entitled Loaded Gun. 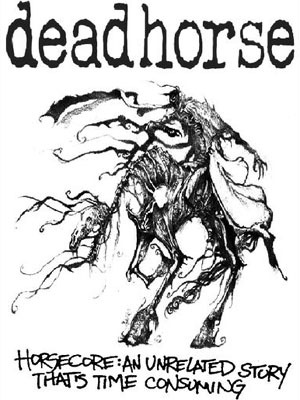 Dead Horse made a name for itself in the late 1980s by continuing the DRI/COC/Cryptic Slaughter/Fearless Iranians From Hell tradition of skateboarder punk/metal hybrid music called “thrash” but adding the surly growling vocals of death metal. With their debut album, Horsecore: An Unrelated Story That’s Time Consuming, the band launched itself to fame with short idiosyncratic songs that displayed more internal variation than most thrash of the era. As the band ventured into the 1990s, it combined thrash with death metal possessing progressive overtones on the 1991 album Peaceful Death and Pretty Flowers, which showed longer songs with bigger themes and more use of harmony. After that, the band released a series of EPs and then fizzled out in the late 1990s after the departure of founding member Mike Haaga. Those who attended the reunion shows claimed a revitalized Dead Horse took the stage, finally sure of its mission without Haaga and in a new musical world order where the raw extremity of early Dead Horse might get it overlooked, not noticed. We look forward to seeing what this band might render in the future, starting with Loaded Gun. Success in life often comes down to timing. Some of metal’s best bands, by virtue of being ahead of the curve, simply get there too fast and go too far to be as noticed as the others who plod along and thus are right about where their audience expects them to be, thus understands them and thus can appreciate them. It reminds me of the friend of mine who wrote an English paper in high school that the teacher dismissed as nonsense; when he handed it in at college, he got an A. He was just too far out ahead of the curve. In the same way, Houston’s Dead Horse were just too ahead in too many ways at once for most people to grasp. Thrash is a hybrid between punk songs and metal riffs, so named because of its popularity with thrashers or skaters. Thrash bands like DRI (also from Houston), COC, Cryptic Slaughter, MDC and Fearless Iranians From Hell (from San Antonio) were famous for short intense songs of social commentary that was more existential and practical than political. Dead Horse took it even further to a nearly literary level. After producing a series of demos that were well-received in the underground and even among “normals,” Dead Horse recorded and self-released their first album, Horsecore: An Unrelated Story That’s Time Consuming. After that, they gigged like maniacs and finally got on a larger label to release their second album, Peaceful Death and Pretty Flowers, at which time a death metal and progressive metal influence was flowering in their music. But after that, they never really got a handle on things again, despite releasing a pair of well-received EPs. As often happens in Texas, the local scene swallowed them, in equal parts of taking them for granted and resenting them for rising so far so fast. Fast-forward to last year. Most of Dead Horse is now gallivanting around in Pasadena Napalm Division, while original frontman Mike Haaga makes his living making oddball soundtracks and performing live. Like many talented people in metal, he left it behind, probably outraged at the simple inability of metalheads to unite to do anything, a self-defeating practice that delights their detractors (what’s better than an opponent who commits suicide?). But the other band members have continued on and played a show in Houston which was memorialized in their Making a Dead Horse Live DVD. According to most recent reports, the band is returning for a live performance at Fitzgerald’s this Saturday, possibly with Kurt Brecht of DRI making an appearance. It’s good to see this legend rise again, and this time, perhaps stay in flight. The wording above says releasing, not releases. There’s apparently a bit of label-shopping and confusion as to when this interesting work will actually land. 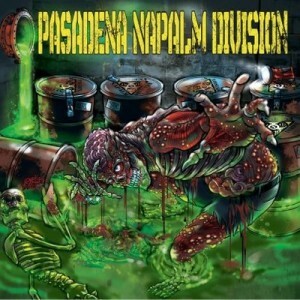 The good news is that when the new Pasadena Napalm Division (P.N.D.) full-length lands it will probably crush your spine. P.N.D. is a thrash band formed of D.R.I. vocalist Kurt Brecht and Dead Horse guitarists Greg Martin and Scott Sevall, joined by drummer Ronnie Guyote. Formed in 2008, the band released an EP in 2010 which was greeted by enthusiasm from the fans. Since this is a project band for Brecht, its schedule is unsteady and depends in part on when he’s not busy with his main act D.R.I.. As explained in a recent article, much of P.N.D’s output arose from times when D.R.I. was out of commission due to guitarist Spike Cassidy‘s health woes. The album will be released on SF-based Minus Head Records, but the exact date is uncertain but likely April or later of this year. Since the band waited over a year to release the album while label-shopping, this means we’re finally getting a glimpse into their 2011 output. Maybe this will spur them on to do even more.